SPX Form No. 100764 Parts List for: 1585 1586 1587 61933 Power Train Lift Insert screen (No. 216296) here before assembling quick connect fitting. (Screens are contained in literature pack.) 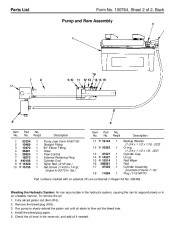 Detail “A ” For pump assembly, see sheet 2 of 2. Grease these areas. 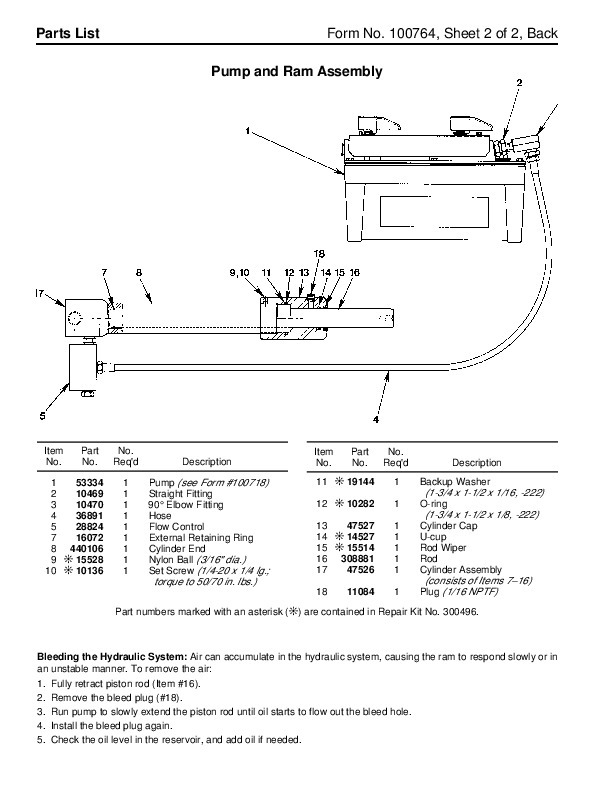 (see Detail “A “) (see Detail “B “) For cylinder assembly, see sheet 2 of 2. 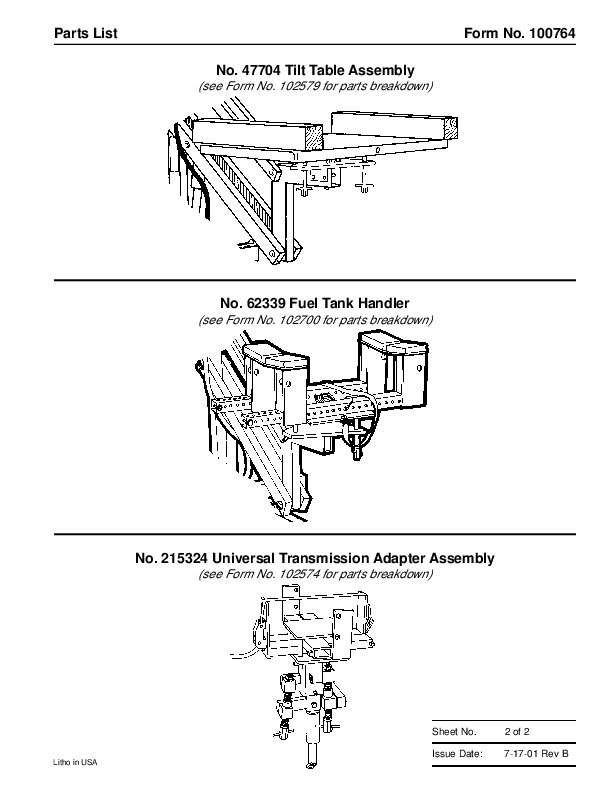 For Tilt Table, Fuel Tank Handler, or Transmission Adapter, see sheet 2 of 2. (see Detail “C “) Grease these areas. Grease these areas. Detail “B ” Detail “C ” Sheet No. 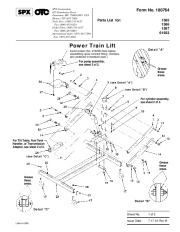 Issue Date: Litho in USA 1 of 2 7-17-01 Rev B Parts List Item No. 1 Form No. 100764, Sheet 1 of 2, Back Description Cap Screw (3/8-16 x 2-3/4 ” lg.) Cap Screw (5/8-11 x 5-1/2 ” lg. ; Grade 8) Washer (for 5/8 ” bolt) Tube Swivel Mast Lockwasher (for 3/8 ” bolt) Nut (3/8-16) Cap Screw (7/16-14 x 4-1/2 ” lg.) Washer (for 7/16 ” bolt) Locknut (5/8-11) Washer (for 7/8 ” bolt) Locknut (7/8-9) Tube Retaining Ring (for 5/8 ” shaft) Pivot Pin Caster Plate Flange Nut (7/16-14) Acorn Nut (1/2-20) Tube Cap Base Non-skid Adhesive Strip (apply 1 ft. strip to each leg) Tee Cap Screw (7/8-9 x 6-1/2 ” lg. ; Grade 8) Cap Screw (5/16-18 x 1-1/2 ” lg. ; Torque to 350­400 in. lbs.) Thread-forming Plastic Screw Pump Bracket Parts Included but not Shown Warning Decal Trade Name Decal Made in USA Decal Danger Decal Refer to any operating instructions included with the product for detailed information about operation, testing, disassembly, reassembly, and preventive maintenance. Items found in this parts list have been carefully tested and selected by OTC. Therefore: Use only genuine OTC replacement parts. Additional questions can be directed to our Technical Service Dept. Parts List No. 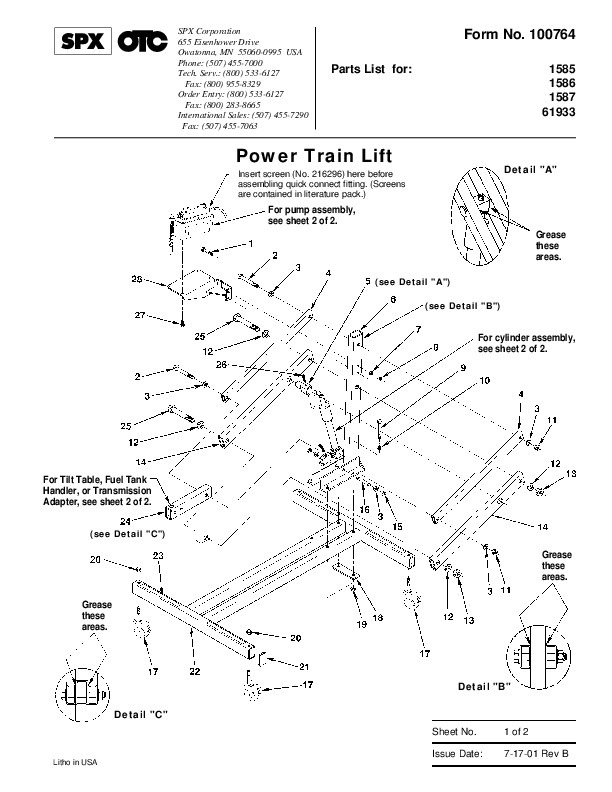 47704 Tilt Table Assembly (see Form No. 102579 for parts breakdown) Form No. 100764 No. 62339 Fuel Tank Handler (see Form No. 102700 for parts breakdown) No. 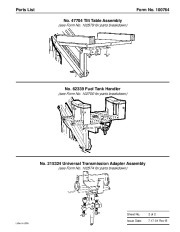 215324 Universal Transmission Adapter Assembly (see Form No. 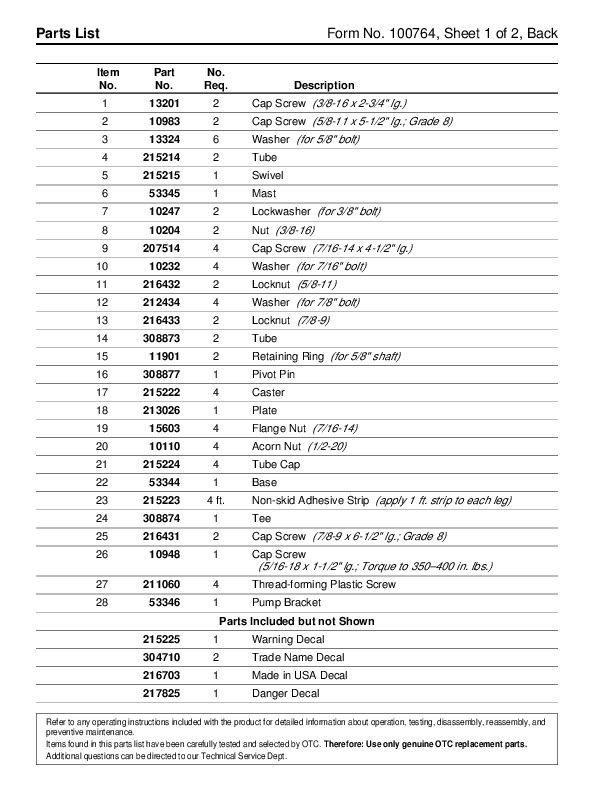 102574 for parts breakdown) Sheet No. Issue Date: Litho in USA 2 of 2 7-17-01 Rev B Parts List Form No. 100764, Sheet 2 of 2, Back Pump and Ram Assembly Item No. Part No. No. Req’d Description Pump (see Form #100718) Straight Fitting 90° Elbow Fitting Hose Flow Control External Retaining Ring Cylinder End Nylon Ball (3/16 ” dia.) Set Screw (1/4-20 x 1/4 lg. ; Item No. Part No. No. Req’d 1 1 Description Backup Washer 1 53334 2 10469 3 10470 4 36891 5 28824 7 16072 8 440106 9 j 15528 10 j 10136 11 j 19144 12 j 10282 13 47527 14 j 14527 15 j 15514 16 308881 17 47526 18 11084 (1-3/4 x 1-1/2 x 1/16, -222) O-ring (1-3/4 x 1-1/2 x 1/8, -222) Cylinder Cap U-cup Rod Wiper Rod Cylinder Assembly torque to 50/70 in. lbs.) 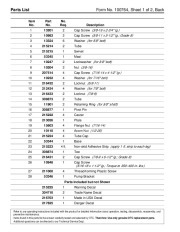 (consists of Items 7­16) Plug (1/16 NPTF) Part numbers marked with an asterisk (j) are contained in Repair Kit No. 300496. Bleeding the Hydraulic System: Air can accumulate in the hydraulic system, causing the ram to respond slowly or in an unstable manner. To remove the air: 1. Fully retract piston rod (Item #16).